Some time ago I have described the HAL library from STMicroelectronics along with SPL and other solutions. I have found that other people have already started some work regarding the U8glib for STM32. This blog post describes a general rule how a communication interface should be ported. However, the Author is using the SPL. The approach can be generalized and used to write a driver for STM32 HAL. How does the U8glib works? This makes porting drivers to different platforms a lot easier. The Author of the U8glib separated device routines, the driver itself, from the hardware layers. This allows a developer to focus on the part on which he or she wants to. If you are not interested in what you should send to the display to initialize it and instead you would like to work closer to the hardware you can focus only on the hardware abstraction layer (HAL, what a coincidence :)). To create an instance, device with communication interface union, you have to write a line of code like below. This binds the device with the communication layer. Say, if you want to draw a line and you know you have to send 0x12 0x00 0x00 0x2F 0x1F to the display you do not have to worry about it. The device layer sends it to the physical layer and that’s all. Now, it is the physical layer’s task to actually transmits the data to the display. U8G_COM_MSG_WRITE_SEQ_P: write byte sequence to device from flash (program memory). It is not very efficient way to send data, or copy the date on 32-bit MCU. Firstly, you lose time to copy the data and secondly you waste memory for it. Of course, now the microcontrollers have more and more resource but if you can save them than why not? The second issue is referred to the amount of data you want to send. It should be actually arg_val + 1 because you send one extra byte. Having all this covered I prepared my own implementation of the driver for SSD1603 screen controller. 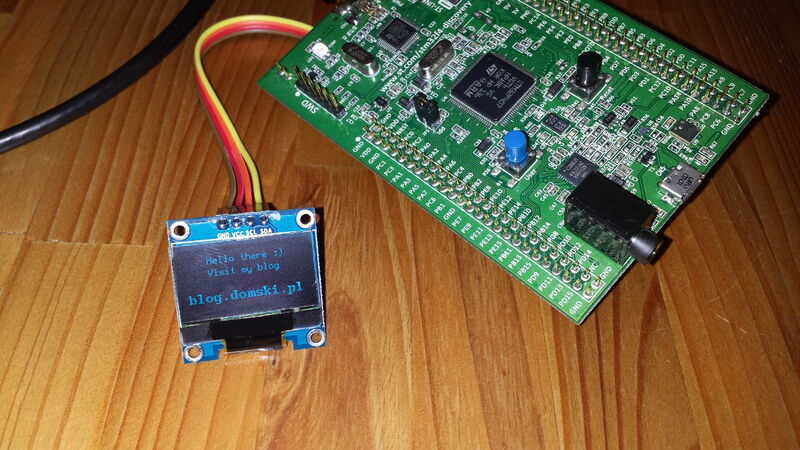 As you can see I am using HAL_I2C_Mem_Write() function instead of HAL_I2C_Master_Transmit(). This allows you to send an extra byte/bytes followed by actual data. In this way you do not have to copy it manually to a buffer. Basically, HAL_I2C_Mem_Write() plainly concatenates two chunks of data by sending one after another. This is commonly used i.e. for data transfer with sensors like accelerometers, magnetometers, etc. Firstly, you have to point a register address to which you want to write to or read from and after that the data should follow. How to use the driver? call u8g_Begin(&u8g) function is unnecessary because the initialization function u8g_InitComFn call it when return. Yes, you are right. It is called at the return statement of u8g_InitComFn(). Hello. I have a STM32F103C8T6 board and a same display as you. From the start I will like to say that I’m a noob with the STM32F103 board. First of all can you tell me how to wire the board to the display. Second can you tell me what files need to go were and can you give me a simple sketch example for the Arduino IDE that I can use to display a simple text line? Thanks and have a nice day. I do not know about the Arduino IDE but I can prepare a simple example in SW4STM32. Actually, I had this in my plans all along 🙂 I will upload this example to my github so you will be able to download it. Ok. After you upload the example ca you post a link to it? The example is available at github. I have tested the driver and is fully working on STM32F103C8T6 development board. The link to the driver itself and to the example can be found at the bottom of the post. Are you sure with the display model? May be SSD1306? Yes, you might be right. Although if I remember correctly it was refereed to as SSD1603. However mine displays look as the SSD1306 you are refereeing to. After giving it a bit of thought I think you are right. Thanks for pointing this out! If I find some time I will make appropriate changes to the repos and the post. Thanks!